The Pearl Golf Links features two Myrtle Beach championship golf courses and they both have very different styles. The Pearl “West” is a links style course that showcases wide scenic vistas and outstanding marshland views. The Pearl “West” is a fun but challenging layout where the fairways are surrounded by marshlands and towering trees. Strategic water hazards and bunkers guard the beautiful, undulating Bent grass greens. Large pampas grass is in abundance giving it that ‘links” feel. The finishing holes overlook scenic marshlands and the beautiful Calabash River. Accuracy and strategy are required to navigate your way through the many hazards. 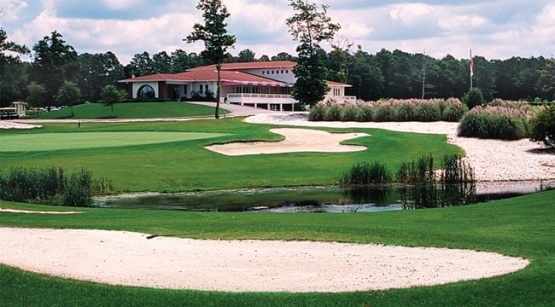 The Pearl “West” is the perfect course to include in your next Myrtle Beach golf package. North Myrtle Beach golf packages offer the very best in Myrtle Beach golf savings. After you finish an enjoyable round at the Pearl you may want to stop in Little River, S.C. and visit the historic Little River water front. There are many outstanding North Myrtle Beach entertainment venues located such as Key West Crazy, Patios, Crab Catchers and Captain Jewels. If you would like to test your luck, you can check out the Big M Casino Boat that is docked on the waterfront. There is something for everyone! It is time to book your Myrtle beach golf package today! View a Virtual Tour of the golf course.